Anyhoo, we have a new Challenge for you over at Tiddly Inks... So Sweet, you'll see now, why I decided to play with Dandy. Aside from the fact she is lush! Before I scoot off for my mornin' cuppa, actually, my second, but let's not split hairs, if you are the same side of the pond as me, you can get the stamp version of Dandy, at Dies To Die For. Just sayin'. O Faye, this is so adorable!!!!! Hellooo Faye! Wow, awesome, amazing, fab......you get the idea! Love your work & will be stalking you...mwah ha ha!! Good golly, Miss Molly! This is fantastic! What a lovely colored dandy!! Wow, what amazing colouring, and I love your pastels!! Oh so pretty! I love how you coloured the dress! Awesome colouring. I love this. Well Dandy just looks fine and... errr... dandy in her gorgeous apricot dress!! 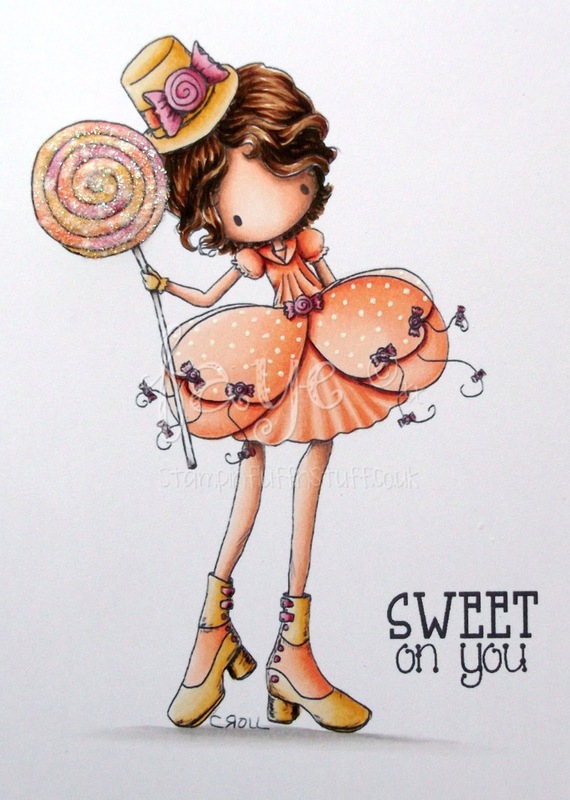 Of course, I love what you did with her... especially the sparkly lollipop! !